Edward, eldest son of Queen Victoria and Prince Albert was born in Buckingham Palace in 1841. He was educated privately and at Edinburgh University, Oxford University and Cambridge University. In 1860 Edward became the first member of the royal family to tour the USA. When he returned to England he was involved in a scandal with a Irish actress. Prince Albert died a few weeks later and Queen Victoria blamed her son for her husband's death. Victoria later declared that was never able to look at the boy without a shudder. After the death of Prince Albert Edward took his seat in the House of Lords as the Duke of Cornwall. Edward, who spoke French, German, Spanish and Italian, toured the world on behalf of the royal family. This included trips to Italy, Spain, Canada, India, Egypt, Denmark, France, Germany, Belgium and Russia. In 1863 Edward married Alexandra, eldest daughter of King Kristian IXof Denmark. Alexandra had six children, Albert, Duke of Clarence (1864-1892), George (1865-1936), Louise (1867-1931), Victoria (1868-1935), Maud (1869-1938) and Alexander, who died soon after being born. Edward had a regular annual routine. He spent Christmas at Sandringham, three of four weeks at Buckingham Palace, Biarritz in February and March, Easter at Windsor Castle, summer in London with regular visits to the racecourse, an official tour of a foreign country, country-house visits for grouse-shooting, three weeks at a foreign spa, October at Balmoral and November and December at Buckingham Palace. Prince Edward had a great appetite eating five large meals a day. These meals often consisted of ten or more courses. By the time he was middle-aged he had a waist of forty-eight inches. Edward also smoked twelve large cigars and twenty cigarettes a day. Queen Victoria disapproved of Edward's interest in horse-racing, theatre-going and yachting. Edward had several mistresses including Lily Langtry, Alice Kepple, Lady Brooke, Princess de Mouchy and Princess de Sagan. Edward was involved in several scandals. On one occasion it was discovered that he had been playing in an illegal card-game and in 1870 he was accused in court of having an affair with Lady Mordaunt. Victoria was horrified by her son's behaviour and warned that evidence of a pleasure-loving and immoral aristocracy might provoke the working class into adopting radical political ideas. Edward attempted to gain the support of the working-class by inviting their representatives, such as Joseph Arch and Henry Broadhurst to stay at his country house at Sandringham. When Broadhurst visited Sandringham he did not take with him the right evening dress, and so he had to eat his meals in his bedroom. Edward VII became king on the death of Queen Victoria in 1901. Although he was 59 when he became king, he restored some vitality to the monarchy. He made several royal visits and helped to prepare the way for international treaties with France and Russia. The king took a particular interest in military matters. He opposed attempts to reduce public spending on the armed forces and was a strong advocate of the Dreadnought building campaign. Politically, the king favoured the Conservatives. 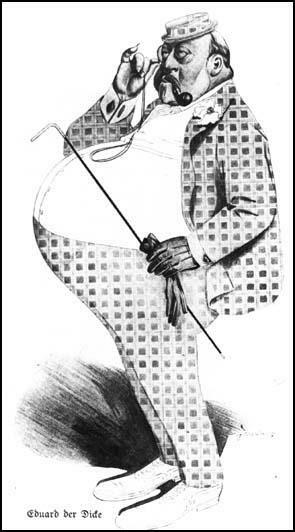 He was totally opposed to the campaign by the NUWSS and the WSPU to achieve the vote for women. He disliked the Liberals, especially those such as Henry Campbell-Bannerman and Dave Lloyd George who had opposed the Boer War. 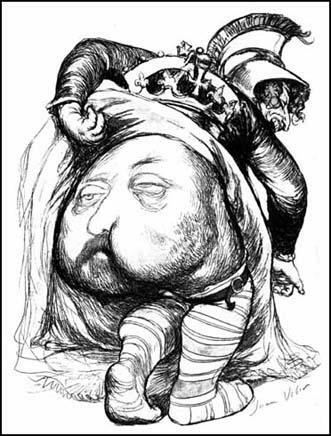 Edward VII was disappointed when the 1906 General Election brought the Liberals to power. Attempts to redistribute wealth resulted in Herbert Asquith and his government coming into conflict with the House of Lords. After the Lords had rejected the People's Budget in 1909, Herbert Asquith and his chancellor, David Lloyd George, asked the king to create a large number of new Liberal peers to give the government a majority in the House of Lords. The king refused, insisted that the issue should be put to the electorate in a General Election to make sure that the public supported reform of the House of Lords. 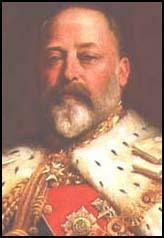 In the middle of this dispute, the king became very ill. Edward VII died at Buckingham Palace on 6th May, 1910, leaving the constitutional crisis to be solved by his son, King George V.
(1) Henry Hamilton Fyfe was a journalist who worked for the Daily Mirror and the Daily Mail. He met the king several times during the 1909 constitutional crisis. The King was popular. He owed his popularity to his really charming smile. In private and in public that was his most valuable gift. He had a certain shrewdness too, and a kindly disposition, which made him declare that he would never give his consent to the taxation of the necessaries of life and that "he did not care who knows I have said so." "Tax motors," he said, "tax the rich, but never the poor. Never tax the poor man's food." This was spoken in private and in all sincerity. Had his intelligence been equal to his goodwill, he might have been a leader of the people.